As a talented harpist, probably the best thing that could happen to you would be to fall in love with your most favourite instrument of all, an instrument that touches the deepest parts of your soul and that lifts you. But then, if that wasn’t enough, you fall in love with and marry the son of your harp teacher, someone who has taught you privately for some eight long years. And then your future mother-in-law helps you to mature professionally until you are ready to take the harp world by storm – well that’s just a bonus! And just when you are wondering whether it can get any better, as a 20-year-old, you are chosen as the first Royal Harpist to the Prince of Wales of the United Kingdom since 1873. For the next years, you experience a world of palaces, castles, and of course performing for the royal families that dwell in them. Her name: Catrin Finch. Her instrument: the harp. This is what happened to the young and ambitious harpist, Catrin Finch from Wales, often nicknamed the ‘Queen of Harps’. She is only thirty-three years old but she has seen it all and has been walking the path of music, the path of the harp, for years. But now her story has reached yet another high point. The renowned harpist, who first touched the strings of what she calls ‘the magic instrument’ at the age of six, has recently been commissioned with a very special task: to compose a piece of music for the Third Wales International Harp Festival, which will take place in Caernarfon in the North of Wales, between April 20 -26. This will be her second professional commission as a composer. The music she will compose is entitled 'Adar Rhiannon', which is Welsh for 'Birds of Rhiannon'. According to Welsh mythology, the birds of Rhiannon are supernatural creatures whose song can "wake the dead and lull the living to sleep". These creatures belonged to the horse goddess Rhiannon and were coveted by the giant Ysbaddaden Bencawr (the 'Chief of Giants'). Catrin Finch is very honoured to be given this commission and the opportunity to develop her composing work, alongside working on some new exciting musical ideas in her studio in Wales. "You have to look as good as you sound." Catrin Frinch is a happy, radiant woman. She has one husband, one career, two children, and five harps. She has also become world-famous and performed in concert halls all over the world. Inspired to take up the harp at the age of six, her rise to prominence started early, when, at the age of nine, she achieved the highest-ever mark in the UK for her Associated Board Grade VIII exam. The elegant and stylish harpist ("When you perform it is important that you look as good as you sound"), has been playing harp for 27 years now. She usually only plays one harp at the time, but sometimes amazes her audience by playing two harps together. 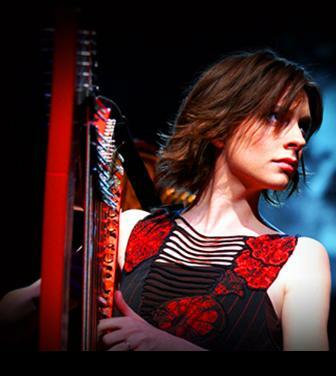 Catrin: "I fell in love with the harp when I was 6 years old. I went with my parents to a concert by Marisa Robles, a world-famous Spanish harpist in those days. She was a very inspirational person and when I saw her playing the harp, I decided that I wanted to be a harpist like her. So, on my birthday that year, my parents rented a small harp for me. I then started taking lessons with a teacher at a local school. We have a great harp tradition in Wales, where harp teachers come to schools to teach the children. It went very well and I stayed for a year and a half with her, but I developed quickly and soon needed another teacher." "When I was nearly 8 my mother took me to a harpist in the North of Wales, Elinor Bennett, who lived some 3 hours away from our house. I started studying with her and kept on doing this almost every fortnight for 8 long years. Then, at the age of 16, I went to the Purcell School of Music in London, where I studied for 2 years, and after that I studied for 4 years, until I was 22, at the Royal Academy of Music. There I graduated with a first class honours degree and in my final year I won the Queen's Award, which the Academy gives to the most outstanding student of the year." "Playing harp becomes an addiction." "When you are young and you develop quickly, it is like a drug, it becomes an addiction. I learned a lot from Elinor, who is now my mother-in-law, since I married her son Hywel, who plays the guitar. Elinor really was the beginning of my career and gave me everything I needed to flourish as a young musician. It was obvious from when I was very young that I would be a musician as I learned very quickly. In the UK we have eight music exam grades set by the Associated Board of Music. I had already passed all the ëxams by the time I was 9 and that is something you normally reach when you are 18." In 2000, following her private studies with Elinor Bennett, she studied with Skaila Kanga at the Purcell School of Music and gradually she gained international fame as the first Royal Harpist since Queen Victoria’s reign; a four-year role that saw her playing at Royal Palaces across the world. 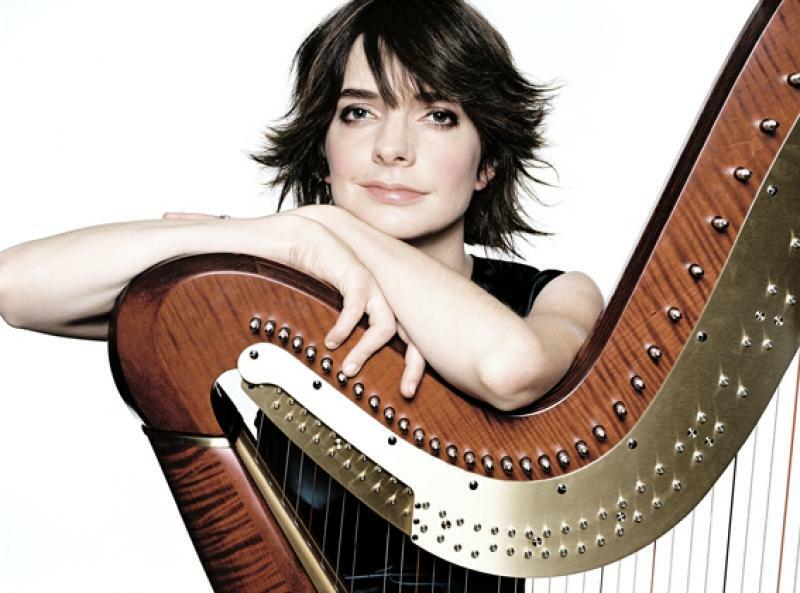 Catrin: "Being the Royal Harpist was a great honour. These performances were a great opportunity for me to get many experiences playing in castles and palaces for wonderful audiences for four years and in that way to develop my career and my name. It was a huge honour, I was only 20." Goldberg Variations by Bach. Catrin: "I love Bach, because it is very clever, interesting music." Catrin Finch has performed in many prestigious venues with top symphony and chamber orchestras worldwide, such as the Boston Pops Orchestra, the New York Philharmonic, the Royal Philharmonic Orchestra, the BBC Concert Orchestra, the BBC National Orchestra of Wales, the London Mozart Players, the Charlotte Symphony, the North Carolina Symphony and the Manchester Camerata. International music festival appearances include Salzburg, Edinburgh, Spoleto, Smithsonian Folklife, MDR Musiksommer Festival in Leipzig, and Le Domaine Forget and Lanaudiere Festivals in Canada. Other international competitive successes include winning the Lily Laskine International Harp Competition in France, the Young Concert Artists International Auditions in New York, and a coveted 'Echo Klassik' award in Germany. Critically, she is probably best known for her dynamically varied performances and her enterprising interpretations and arrangements, which challenge prevailing perceptions about the harp. In 2009, her acclaimed arrangement of J.S. Bach’s Goldberg Variations - which shot to the top of the UK classical charts – was the first to transcribe all thirty variations for the harp. Catrin: "I love the music of Bach, because it is very clever, interesting music. But I also love the French impressionists, like Maurice Ravel and Claude Debussy, because I think it is the most beautiful music." Celtic Concerto performed by Catrin Finch and Budapest String Orchestra at the International Harp Festival in Gödöllö, Hungary, October 2013. The beauty of music comes from within. Catrin has recorded for most major international recording labels, including Universal Records, Deutsche Grammophon, EMI and Sony Classical, both as a solo artist, and with artists such as Bryn Terfel, Sir James Galway, Julian Lloyd-Webber, and Katherine Jenkins. She has also received honours from the University of Wales, Glyndwr University in Wrexham who have named a multi-million pound arts venue in her honour, the Royal Academy of Music, and the Royal Welsh College of Music and Drama. She is a Visiting Professor at the latter two institutions. Catrin Finch has also performed a lot with Karl Jenkins, with whom she has often collaborated, and with Seckou Keita (see below). Catrin’s renowned unconventional take on performing and composing, has made her a media hit too. In 2003, she presented a documentary about herself entitled ‘Charlie’s Angel’, later awarded a BAFTA Cymru/Wales Award for Best Music Programme, whilst in 2012, a behind-the-scenes documentary on the Blessing album was broadcast on S4C and ITV Wales. Known for her community and outreach work, she recently piloted the Catrin Finch Academy Summer School, which aims to offer real and virtual masterclasses to promising young harpists and schoolchildren alike. Students of all levels and ages will get world-class tuition from international harpists. Given her urge to explore musical frontiers, it is not surprising that she recently added composing to her repertoire of skills, and is currently studying a Post-Graduate degree in composition at The Royal Welsh College of Music and Drama. ‘Blessing’, the chart-topping 2012 album collaboration with composer John Rutter, includes her own composition ‘Celtic Concerto’; whilst 2013 brougth the news of an official commission by the National Youth Orchestra of Wales to write a new harp concerto. Catrin: "I started composing nearly two years ago. Last year I wrote a harp concerto, which we performed in Germany and the UK with the National Youth Orchestra of Wales. And now I have been asked to write a piece for the International Harp Festival in Wales, which I enjoy very much. I was asked to write about the theme 'Adar Rhiannon' (the 'Brids of Rhiannoon'), and as a child in Wales youj grow up with that story. They are old Celtic-Welsh myths, belonging to the 'Mabinogion'. My composition is written for many instruments, like harps, cellos, flutes, and there also is a big childrens' choir. I will be performing as well. Of course it is lovely to hear your own work being performed by many instruments. That is a wonderful experience. 'The work comses from my heart and my mind. It is very pleasing to sit down and write music and it gives me even more pleasure to hear it performed by other musicians." Catrin Finch performing a duet with Seckou Keita from Senegal (West Africa), who plays the kora. A shared musical journey between two world class virtuosos. The harp occupies a vital place in the rich cultures of both Senegal and Wales.and both nations share a centuries-old bardic tradition of intricate oral history, expressed through music, song and verse. 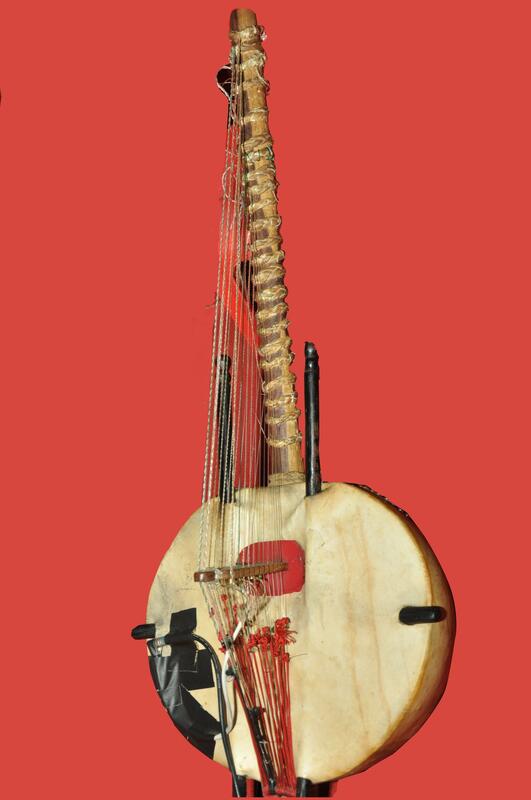 The kora and the harp are distantly related from a historical perspective. 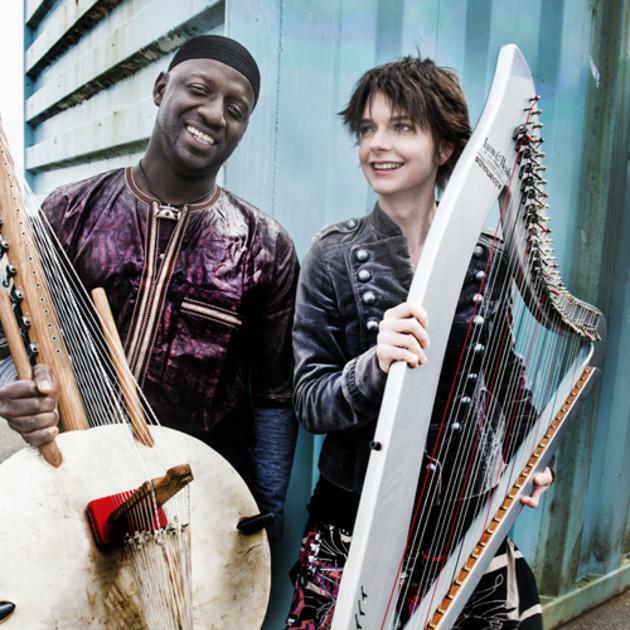 Catrin Finch and Seckou Keita, world-class exponents of these instruments, play together to produce a fusion of rhythmic Mandingo music from West Africa and old Welsh melodies. 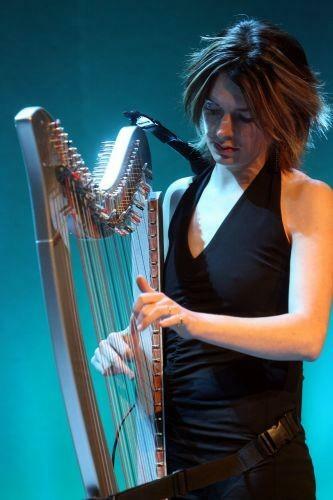 Catrin Finch, from Wales, is often called the “Queen of Harps”. Having trained as a classical harpist, she has expanded her boundaries by playing with the Colombian group Cimarrón. The charismatic master drummer and kora player Seckou Keita is a descendant of the renowned Cissokho family of griot musicians and tellers of tribal histories from Senegal and of the royal Keita family from Mali. He has lived in England since 1998 and has performed widely as a solo artist, with Baka Beyond and in the Jalikunda project. On the 14th of March Catrin will be performing with Seckou Keita in the Queen Elizabeth Hall, Southbank Centre, in London. Catrin: "I met Seckou at a project organized by the Arts Council of Wales, a year ago. And we decide to form u duo.We have already produced a CD, entitled 'Clychau Dibon', which means 'Bells of Bird''in English. We did many concerts last year. For me it is nice to experience his music and his culture. We will be giving many more concerts this year. The kora (photo right) is a 21-string bridge-harp, built from a large calabash covered with cow skin. The skin is supported by two handles that run under it, and it supports a notched double free-standing bridge. It doesn't fit into any one category of musical instruments, but rather several, and must be classified as a "double-bridge-harp-lute." Seckou Keita explains: "I was raised by my mother’s family, the Cissokho’s in my grandparents’ house. We are a family of kora players, a traditional Girot family, where music and stories are passed down through generations from father to son. I was educated in this traditional way and you could say I was destined to become a kora player. Music was part of my everyday life whether in my grandfather’s compound, out in the streets or in the centre of the many local celebrations. Once this music becomes part of you it sticks with you your whole life. There is no formal route to becoming a kora player, you just have to listen, memorise, and experiment, then keep trying til you get it right. In my grandfather’s house, you are taught how to build a kora at the age of 7, then by 14 you start experimenting and learning the repertoire. Only when you have earned it, you will have a kora built for you. I got my first kora when I was 18."